Fourteen TwentySix is the child of Dutch talent Chris van der Linden, a man who has a busy musical life, with different proposals but always with satisfactory results. 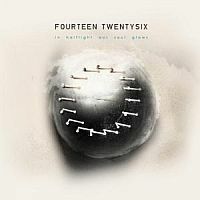 I am a huge fan of 1426’s “Lighttown Closure”, there are some songs that I really love, that is why I kept my interest in this band and wanted to get their newest album, entitled “In Halflight Our Soul Glows”, which features 15 tracks and a total time of 48 minutes of a good mixture of electronic-alternative-progressive rock. The album opens with a short introduction entitled “Echo”, honestly not the best introductory track I’ve listened. It leads to “Summer Snow” which is a more elaborated piece, with nice percussion, melancholic vocals and a guitar as background. Seconds later the electronic feeling can be appreciated and will prevail until the very end (that is one of 1426’s main characteristics). “Sleepwalker” continues in the same vein, a mid-tempo track, a constant guitar as background while drums play and vocals sing. The final minute is pretty good, more chaotic and different. The next song is “For a Second” which starts with repetitive but addictive guitar notes accompanied by drums and the voice. This is an interesting track, I like its changes and the nuances that are being implemented while the seconds pass. If you listen to it with good headphones your appreciation will be better. “Decelerate” may be one of my favorite tracks here, I find it pretty interesting, sensitive and ambitious, it also reminds me of their debut album. That mixture of electronics with Chris’ voice and the guitar is great. After three minutes an acoustic guitar appears and that makes another beautiful moment. “Noon” is a nice instrumental interlude that leads to “Hollow”, which is another good song that sums up what 1426 is about. “Fall From Gravity” has a heavier feeling, maybe due to the bass sound which is more powerful than the previous tracks. There is also a chaotic moment here after 2:30 minutes we can feel some tension and nervousness, which is something I adore in music, so the musicians do the right work and can transmit emotions. This is a highlight of the album without a doubt. “Every Line” is the first of two tracks that pass the 5 minute mark, and it is also the first one featuring a guest voice. Mick Moss of Antimatter puts his grain of sand here, and give a very good result combined with the cool music of 1426. “Rush_Run” is a short and chaotic track, seems like a pursuit in the first minute and it all vanishes all of a sudden, until in the second minute a piano and the female voice of Vera Dirks appear. The next song is “Little Diamonds” which has a mellow sound and emotional voices, I like the rhythm implemented by drums and the textures the guitars and keyboards produce, this is a good example of progressive (crossover) rock, listen to it and you will understand. “Halflight” is another short piece with delicate vocals, nice acoustic guitar and a tense background. “The Crossing” is the longest composition here, it perfectly takes all the elements that the band has previously shared on the album and puts it in one song that may be the pinnacle of this release. I love the tension produced by the guitar that sounds as background, while the voice is still soft and mellow, the drums are always accurate and the emotions like a rollercoaster. “23/59” is a short instrumental piece with an atmospheric sound, a relaxing mood. And the album finishes with “Funeral Fire”, a song that clearly says goodbye, just one minute and a half of repetitive drums, sweet guitars and a mellow voice. Well, I wanted to write this review at least 2 or 3 weeks earlier, but I couldn’t because I was expecting to get more involved with it, but unfortunately I could not find what I was looking for, I mean, with “Lighttown Closure” I fell in love almost immediately and is an album I play regularly, but with “In Halflight…” I cannot say I love it, nor it is a step forward to 1426, I am sorry if I sound harsh, but when something does not move you, as much as you wish, you will not fall in love. The album is very good without a doubt, but something is missing, that is why my final grade will be 7 out of 10.